If you pay yourself first, you will build wealth and get yourself out of the rat race. I did not come to this conclusion on my own. When I was a junior in high school my dad bought me Rich Dad, Poor Dad by Robert Kiyosaki, and my interest in financial literacy was set ablaze. That summer I got a job as an associate for a clothing store. At sixteen years old, when most teenagers were using their paychecks to purchase clothes and gadgets, I started saving for retirement. I used my first check of about $250, to open a Roth Individual Retirement Account (Roth IRA) and I have been determined to retire early (by the age of 50) ever since. A key to building wealth is to always pay yourself first. 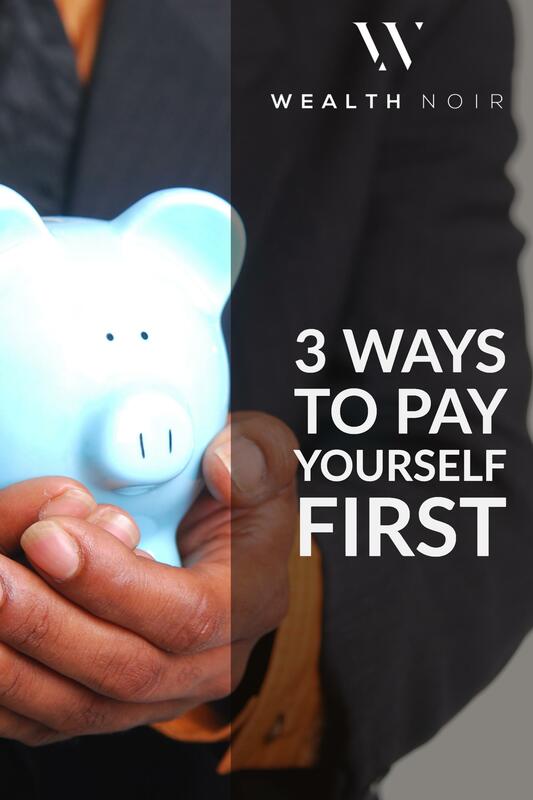 But what does it mean to pay yourself first? It’s about how you spend, save and invest your money. It’s ensuring the first dollar of any income you receive goes toward investing in yourself before anyone else. When it comes to generating wealth and building your net worth, paying yourself first is one of the most important steps. It’s critical that every dollar you earn has a purpose, is well spent and works for you by providing a hefty return. 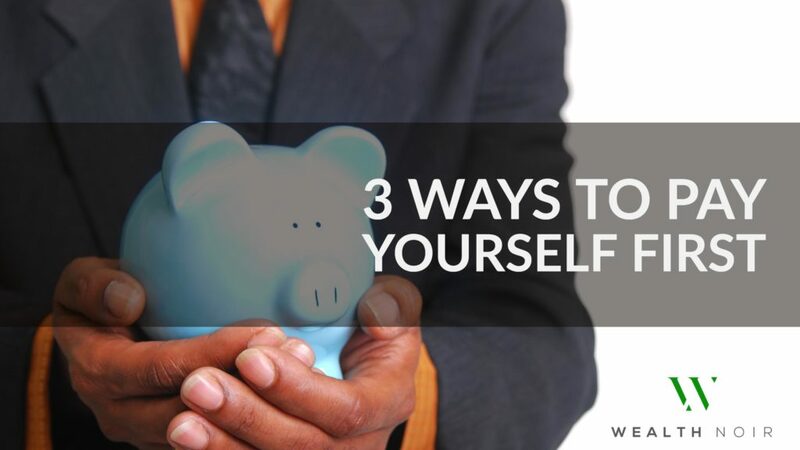 Here are some tips on how to pay yourself first. Take heed and watch your money grow. Regardless of how much money you make, you should always have an emergency savings fund. When starting your fund, set aside some money each month for emergency savings by paying yourself first. It is recommended that you have six to twelve months worth of living expenses saved for a rainy day. This ensures you are not financially crippled by an unexpected medical expense, job loss, or disability. A significant savings fund also ensures that if you want to take time off work to go back to school, raise children, or pursue a career change, you can make this decision without impacting your household’s finances. Building an emergency savings fund does not happen overnight. The best thing is to set up automatic contributions into a savings account every time you get paid. Your payroll office could make direct deposits to your savings account or you could set up automatic transfers from your bank to your savings account. Your checking and savings accounts do not have to be at the same bank. In fact, I recommend the two accounts are separate so you are not tempted to spend your savings. To get the best bang for your buck, look for a savings account that offers competitive interest rates, no fees, and features that make banking easy like a great app and free credit score. We are fans of Capital One 360 and Ally Bank when it comes to online savings accounts. If your employer offers a retirement account and matches a percentage of your contributions, take the free money! My employer will contribute up to five percent of my salary to my retirement account if I contribute at least five percent of my salary too. This is called a 100% match up to 5%. This means I get a 100% return on my money without any risk. This is actually the best investment most people can ever make. So if your salary is $50,000 (like most Americans), that means you could save at least $2,500 a year and your employer will give you $2,500 too. Compound interest and time will allow your annual investments to grow and multiply. If you start this practice while you are young, your budget will become accustomed to saving for retirement first. It is extremely difficult for many people to increase their retirement contributions once they start a family or increase their living expenses. Therefore, learn to live off less, so you can save the most for retirement. You do not have to save all of your retirement funds in one place to pay yourself first. For those that qualify, sometimes it makes sense to invest in your employer’s fund and put extra money monthly into a Roth Individual Retirement Account (IRA). Roth IRAs are beneficial because when you retire you can take out the money tax-free. And, compared to a Traditional IRA, you can withdraw the money invested before retirement without a penalty. The tax benefits of IRAs come along with rules about accessing your funds. Roth IRAs offer more lenient rules for early retirement compared to other accounts. For 2017, if you are under 50 years old you could contribute up to $5,500 per year into a Roth IRA, depending on your income. Anyone over 50 can invest up to $6,500. Income dictates who can contribute to a Roth IRA. Single people who want to contribute to a Roth IRA cannot make more than $133,000, and if you are married your combined income cannot exceed $184,000. Many people do not qualify for the Roth IRA for very long if they have high salaries or a high combined household income. So if you want to get the tax benefits of a Roth IRA do it while you are a making lower income and are just starting out in your career. If you are a stay-at-home spouse, you also can have a retirement fund. Every time your spouse gets paid — so should you. Talk with a financial advisor or bank about setting up a Spousal Individual Retirement Account. With this account, your spouse can make contributions to a retirement account — in your name — on your behalf. For 2017, the IRS limits annual contributions to $5,500 if you are under the age of 50. Compound interest and time help your money grow, so start saving consistently as early as possible. In terms of where to open an IRA, we are big fans of Wealthfront. Wealthfront is a robo-adviser, which means it uses algorithms to balance your budget, instead of people and emotions. This allows them to be about 75% cheaper and offers the first $15,000 managed for free when you use our link. You can open a Wealthfront account online in minutes. If you can afford it, save by all three methods. This ensures you have money for emergencies, capture all free money offered by your employer and have tax free income you can withdraw in retirement. I have never heard anyone say they saved too much money, so get started now and aim for the highest amount possible. How do you pay yourself first? Share your ideas by leaving a comment. Learn more about savings, investing, and handling your finances by joining our community. Great topic. I save in an emergency fund and 401k. I missed the Roth boat when my income was lower because I just did not understand how it worked until I was no longer eligible. However, there are backdoor ways to contribute to a Roth for high income earners. If your 401k allows after tax contributions and in service rollovers you can actually save a lot more than the $5500 limit each year. Another route I’m looking into to increase my tax free savings is a SEP IRA for the self-employed. Apparently the qualification for self employed aren’t high (I’m a clear cut case) but a friend said he does one because of Airbnb and UberEats work he does. It can really increase your cap. The backdoor Roth option is another good option. I knew a few coworkers who used it to increase their contribution limit.